Advance Tree Pros offers fast and professional tree removal services in Greater Orlando. With years of extensive industry experience, we have the tools and expertise to safely remove trees, stumps, and debris from all commercial and residential properties. With superior services and recycling – we are committed to protecting the environment and abide by all guidelines. With highly skilled ISA Certified arborists, no tree is ever too big or small. We also utilize mobile bucket trucks, massive cranes, and other essential equipment to safely remove and haul all trees and debris to local recycling venues. As your premier Orlando tree removal service, one phone call or e-mail is all you need to access fast and efficient services. Tree removal in Orlando requires an experienced and seasoned hand. In fact, we are committed to protecting your homes and properties from dangerous or damaged trees. These trees have a tendency to fall over into houses and businesses; resulting in extensive damages and costly repairs. At Advance Tree Pros, we have the expertise – training –and skills to safely and effectively remove awkward or aged trees from your properties. We also specialize in salvaging and saving as many trees as possible. 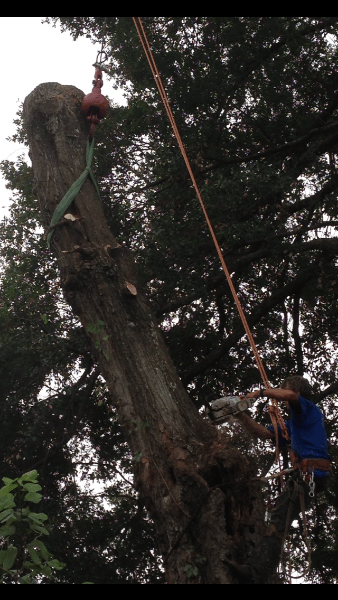 From stumps and Oak to Pine and Elm, we are committed to excellence in removing any trees that are about to fall. We also provide timely cleanup services – including leaves, branches, twigs, and other debris from your homes or businesses. Extra protection needed for safely removing wires that are conflicting with tree removal. Ensuring all animals and wildlife – living in trees –are safely removed and given over to local animal shelters and control. Protecting your homes, businesses, fences, and other structures from cave ins and loose tree fallings. Ensuring all Orlando tree removal services abide by stringent environmental guidelines and regulations. We are very serious about protecting the environment – and truly go above and beyond the call of duty to help save as many trees as possible. Tree Removal Services – What to Expect? Certificates of insurance that are up to date; ensuring customers will not be liable for any injuries, accidents or damages incurred during tree removal services. Copies of contracts and services performed for all new or recurring clients. A company that is fully certified with ISA, TCIA or CTSP. Timely references or list of past and present customers that are satisfied with our work. We also urge clients to check our industry ratings, customer testimonials, and reviews to make a worthwhile and informed hiring decision. We are fully certified, insured, and experienced Arborists. Not only do we remove trees and stumps – but also have the skills to work around wires and electrical conductors. Free service estimates, quotes, and a full range of professional tree stump removal for all area homes and businesses. Advance Tree Pros offers fast and professional tree removal services in Greater Orlando. With years of extensive industry experience, we have the tools and expertise to safely remove trees, stumps, and debris from all commercial and residential properties.